A new report shows the net impact of going ahead with the replacement of the Trident nuclear weapons system will be to cause an overall reduction in defence employment, due to the need to scrap more labour-intensive conventional defence activities to pay for the system designed for the Cold War. The report, ‘Trident, jobs and the UK economy’ is to be launched at the TUC Congress tomorrow [see note 2]. It includes a comprehensive analysis of jobs dependent on Trident, and of the other defence programmes that are put at risk to pay for its £76bn cost. Using official figures, the authors show the cancellation of surface ships, aircraft, armoured vehicles and RAF bases will endanger far more jobs than the relatively small numbers that would go were Trident replacement to be cancelled. 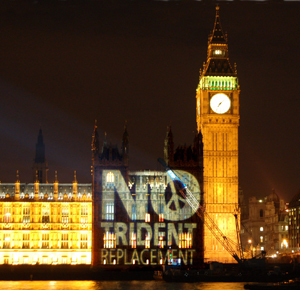 Kate Hudson, General Secretary of the Campaign for Nuclear Disarmament, said “The Chancellor is demanding up to 20% cuts from the MoD and has stated that the cost of Trident replacement will come from the main defence budget. So going ahead with Trident will have a devastating impact on non-nuclear defence manufacturing. “Trident is cash-hungry whilst providing relatively few jobs. Hundreds of millions are to be spent with US-based contractors, providing nothing for the UK economy. Other areas of defence spending at risk from Trident generate far more employment per pound spent. Closing RAF bases and scrapping surface-ship programmes will cause significant job losses in the coming years, whereas cutting Trident would have little impact until at least 2016. You are currently browsing the archives for the Defence category.